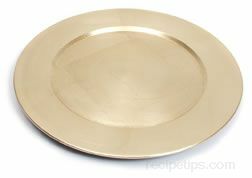 A circular plate, placed beneath a smaller-sized dinner plate that is used to enhance the presentation of the food being served or to set a "tone" for the table setting. Chargers may be made of leather, wood, plastic, pottery, bone china, or metal and are commonly used in homes as a decoration surrounding the dinner plate and also as a decoration in restaurants where they are seldom kept on the table when the main entree arrives. In France the charger is known as a "chargeour" while in the U.K. they are referred to as "underplates."